With the 2014 NFL Draft still a couple of months away, there is plenty of speculation of who's going where. When it comes to Johnny Manziel, it doesn't seem to matter where he goes or what team he ends up on. His early 2014 cards are drawing plenty of attention. 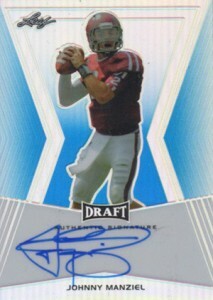 The first Johnny Manziel autographs in 2014 Leaf Metal Draft are topping $100 and up. His 2014 Press Pass autographs are in similar territory. Not bad for unlicensed sets. The Heisman winner looks to be a spark plug in the hobby this year. Following a slow 2013, many are looking forward to seeing what Manziel has to offer. He's a polarizing figure and a lightning rod for publicity, both good and bad. You can guarantee that his every move and play is going to be under the microscope. And while he's going to have his critics, no matter what, he's also captured the attention of the card world. By far, his top card released so far is the one-of-one 2014 Leaf Metal Draft Prismatic Gold. Pulled shortly after the set was released, it's currently listed on eBay with a Buy It Now price of nearly $10,000. The seller is also accepting offers. Other upcoming sets with Johnny Manziel autographs include 2014 Leaf Originals (March 28), 2014 Press Pass Gameday Gallery (April 2), 2014 Upper Deck Football (April), 2014 Leaf Valiant (April) and 2014 SPx (June).